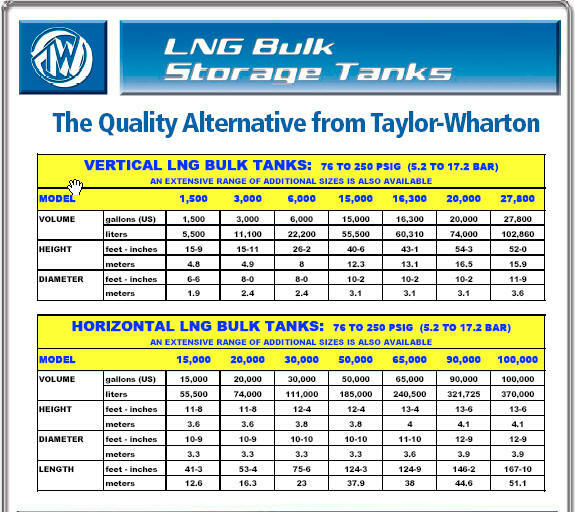 Charts Bulk Storage Systems offering comprises a standard line of pre-engineered tankage (up to 15,000 gallon) and custom engineered storage containers (up to 100,000 gallon) for nitrogen, argon, LNG, and carbon dioxide for industrial gas customers, along with high-purity custom electronic grade tanks, as well as systems for liquid. 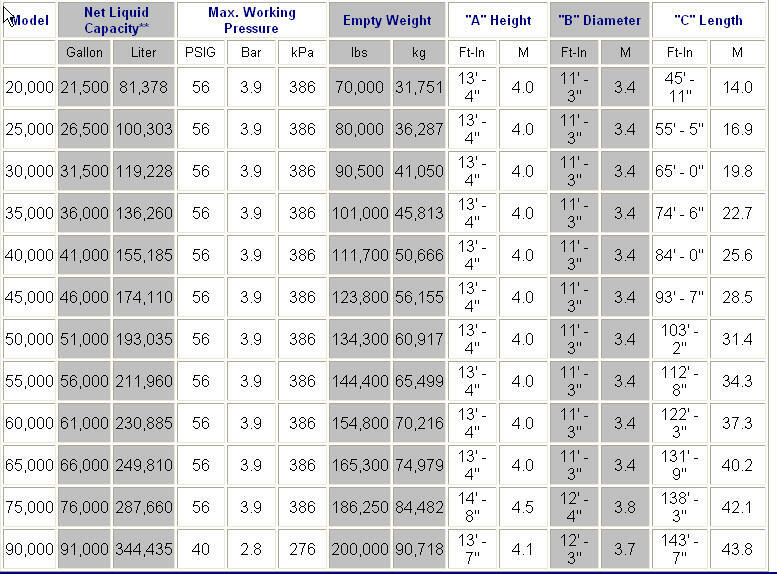 Charts Horizontal Series bulk stations for liquid nitrogen, oxygen or argon are available in sizes from 1,500 to 15,000 gallons (5,678 to 56,781 liters). These HS Bulk Stations are designed to ASME code. 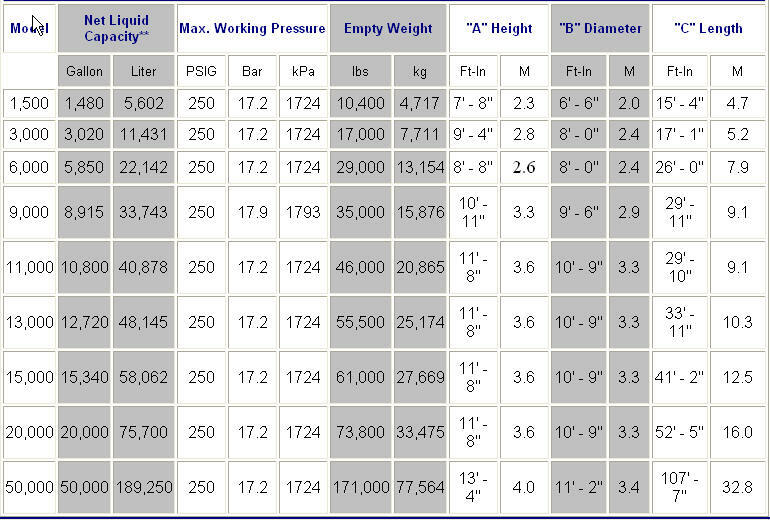 Standards are 175 and 250 psig (12 and 17 bar); other pressures are available upon request. 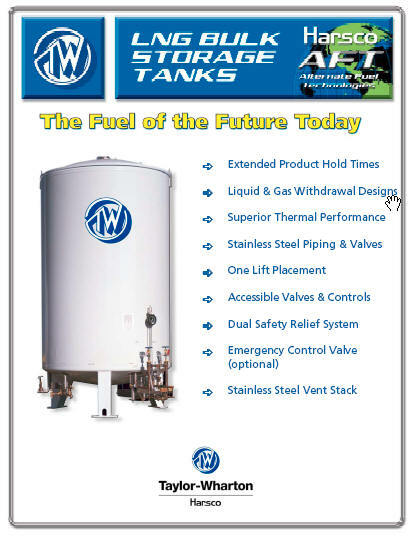 Vertical Hospital Reserve bulk tanks from Chart are stainless steel customer stations designed to receive, hold and dispense liquid oxygen at a constant temperature and pressure. This low cost storage system with industry leading hold times is ideal for applications requiring liquid or reserve supply, such as hospitals, nursing homes and health care facilities, or back-up membrane/PSA systems. 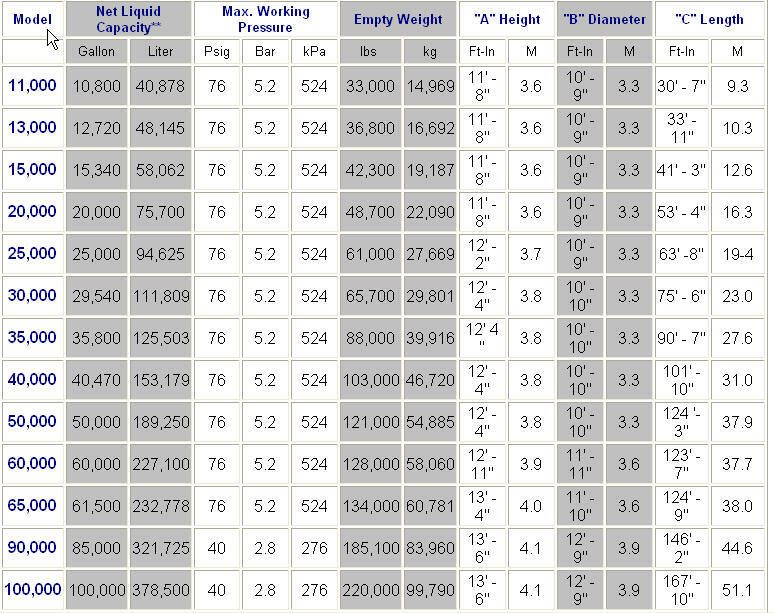 Charts VHR Series tanks are available in sizes from 120-400 gallons (447 to 1,553 liters). 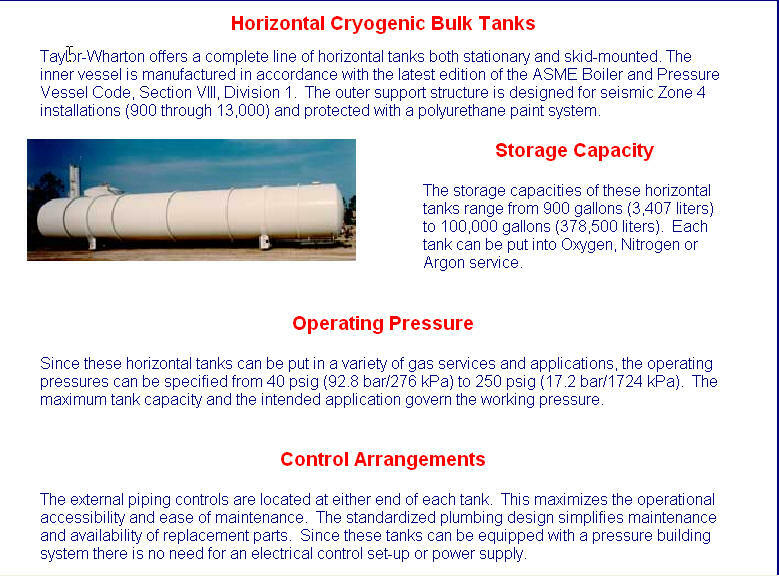 Charts Vertical Storage bulk tanks can be used in liquid nitrogen, oxygen or argon service and are available in sizes from 525 to 15,000 gallons (1,987 to 56,781 liters). 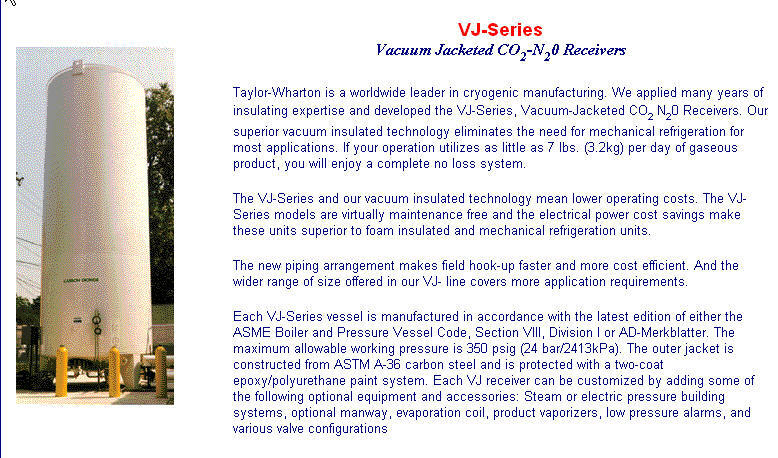 Designed in accordance with ASME code, the VS Series features a composite insulation system for high thermal performance, extended hold times, low life-cycle costs and light weight to reduce operational and installation costs. Charts innovative modular piping system is designed for performance, durability and low maintenance. Chart's VS-CO2 Series of Bulk Carbon Dioxide Storage Tanks offers strength and durability in an all-welded outer container, while maintaining lower life-cycle costs. Our composite insulation system and superior vacuum technology offer ultra-low heat leak and no costly down time to refurbish water-soaked or deteriorated foam insulation. Our VS-CO2 Bulk Stations, in sizes from 6 to 50 Ton (6 - 44 Tonne), are equipped with an internal cleaning system operated externally, eliminating the need for costly manways. Chart's VS-DSS Series of vertical bulk storage stations offer superior performance, durability and value. Designed for liquid nitrogen, oxygen or argon service in sizes from 525 to 3,000 gallons (1,987 to 11,356 liters), these stations are equipped with Super Insulation, a light-weight system offering better thermal performance than Perlite. Our VS-DSS Models modular plumbing system has been selectively optimized to meet the flow requirements of a complete range of liquid or gas applications and features user-friendly bronze valve manifolds and separate economizer and pressure building regulators. Chart's VS-High Pressure Bulk Stations are engineered for superior performance, durability and value, using liquid nitrogen, oxygen or argon service, and designed to ASME code. Our XCEL composite insulation is a lightweight system offering superior performance compared to Perlite or Super-Insulation and is easier to maintain, offering longer product hold times. Available in sizes from 900 to 6,000 gallons (3,407 to 22,712 liters) for the 500 psig (34.5 bar) models and 900 to 11,000 gallons (3,407 to 41,640 liters) in the 400 psig (27.6 bar) models. The Siphon 100 System from Chart gives you the most economical, reliable and highest performing pumping system for high pressure and liquid cylinder filling. The Siphon 100 System is the combination of two revolutionary technologies in cryogenic bulk tanks: Thermal-Siphoning to reduce and efficiently reprocess the heat of pumping; and EXCEL Composite Insulation, 30% to 70% more efficient than Perlite or Super-Insulation in reducing the heat from the atmosphere. Charts Cryo-Control Series storage systems are tailored for liquid or gas applications in nitrogen, oxygen, or argon service. These systems are offered in a wide range of sizes, with a maximum allowable working pressure of 250 psig (17 bar). This line of storage systems offers all of the proven performance and technology found in any of Charts standard storage offerings, along with several additional features. Suitable for electronics and other high-purity needs, these tanks can be horizontal or vertical and are available in sizes from 1,500 to 85,000 gallons (5,678 to 321,760 liters). 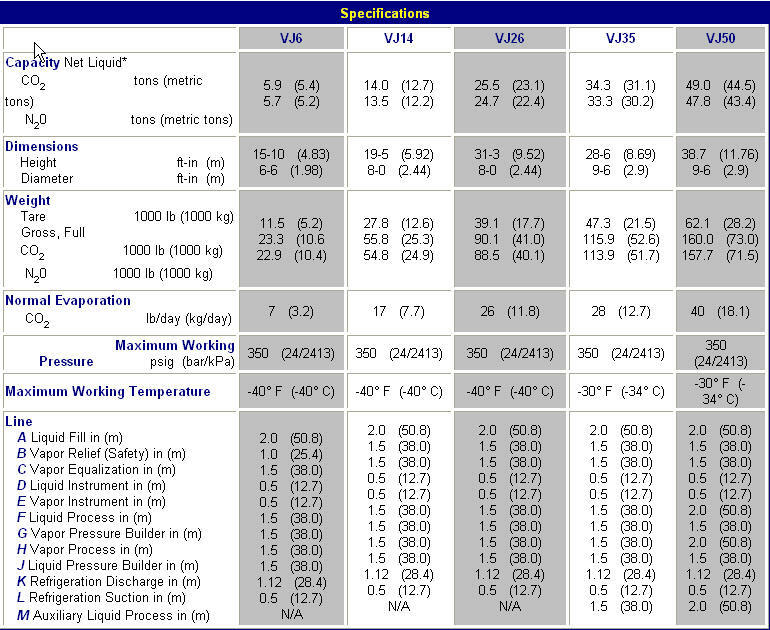 Designed in accordance with ASME Code, with 175 or 250 psig (12.1 or 17.2 bar) or Custom Pressure. Industrial or Electronic Grade liquid hydrogen tanks are available in sizes from 1,500 to 50,000 gallons (5,678 to 189,271 liters). Featuring stainless steel pressure vessel, piping and valves, and Perlite or Super Insulation (MLI), these horizontal or vertical tanks come with 150 or 175 psig (10.3 or 12.1 bar) standard; custom pressures available upon request. 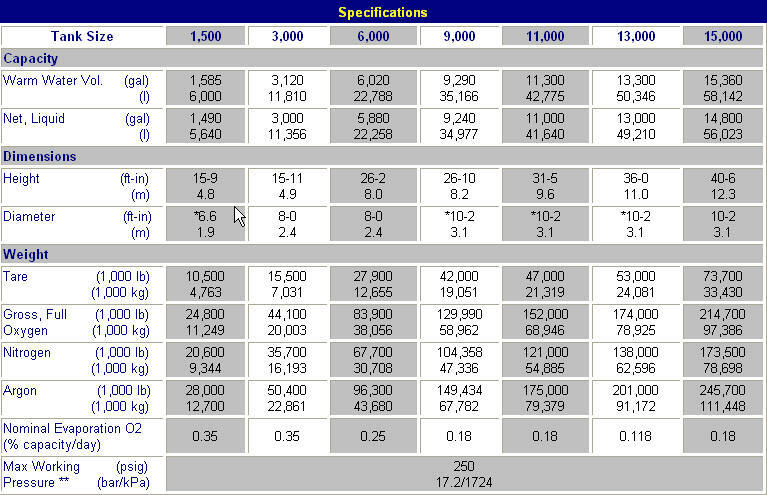 Liquid natural gas applications for traditional peak shaving, base load heating and base load industrial uses. 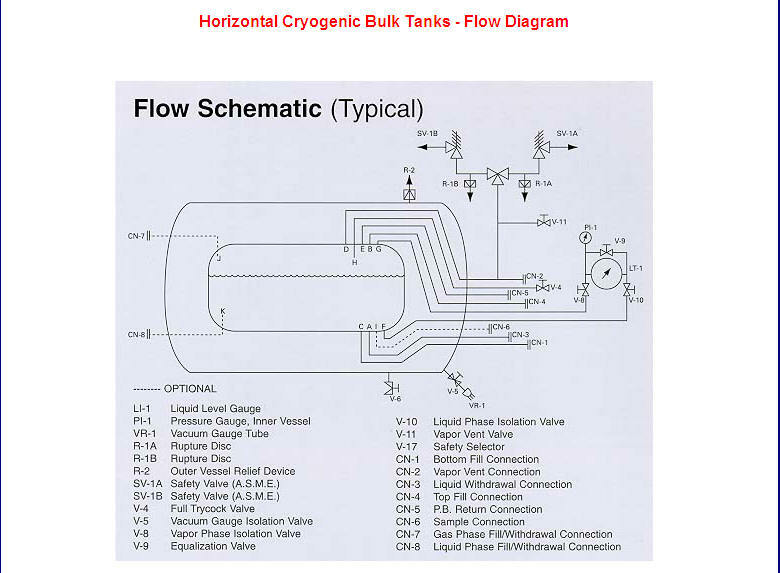 Available in sizes from 1,500 to 85,000 gallons (5,678 to 321,760 liters) with stainless steel pipe and valves for flammable cryogenic liquid service. 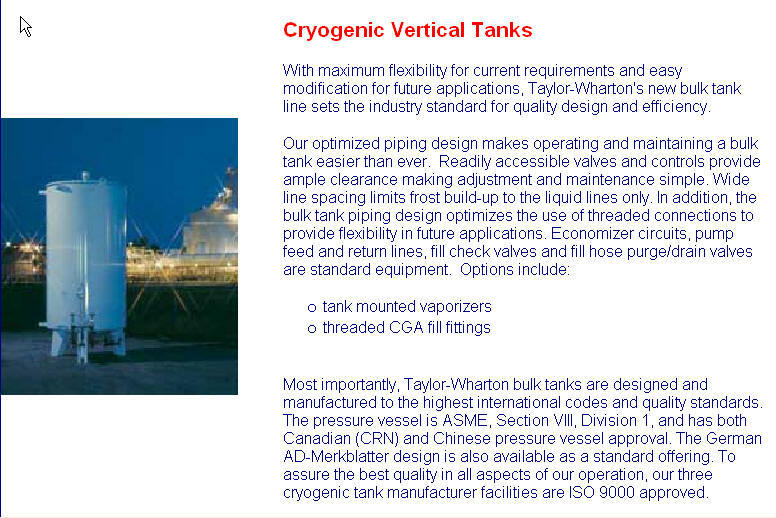 Bulk Storage Tanks in sizes from 15,000 to 85,000 gallons (56,781 to 321,760 liters). 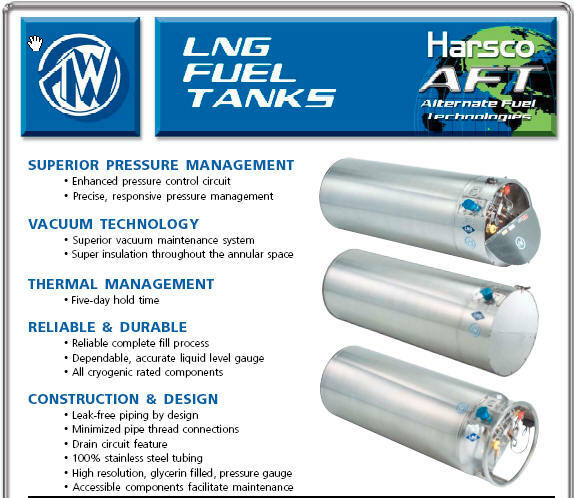 These horizontal or vertical tanks are available in any pressure or piping configuration and feature Perlite insulation and a 9% nickel or stainless steel inner vessel. Designed in accordance with ASME Code, with B31.3 Piping Code. Complete submittal packages for contractors, municipalities, and AE&C firms. 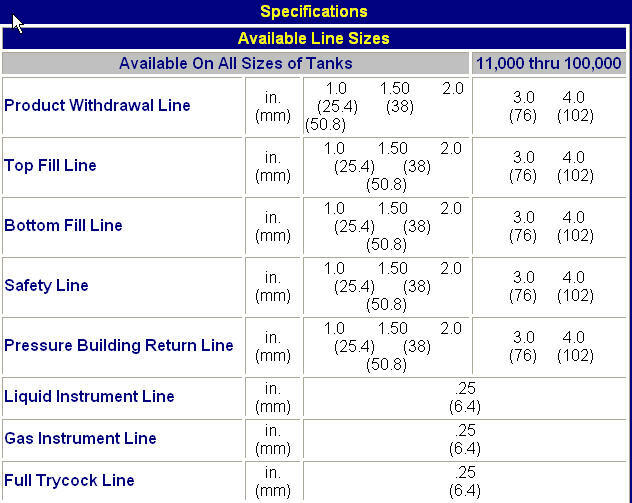 Contact Patrick McCarthy for your ACME tank requirements.